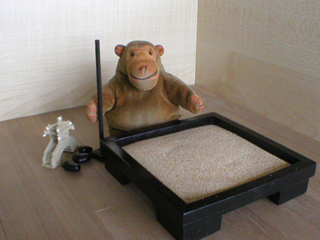 Mr Monkey was looking around his house when he found a box claiming to contain everything he needed to have a Zen Garden of his own. He decided it would be interesting to see what was in the box, and whether monkeys are good at contemplation. 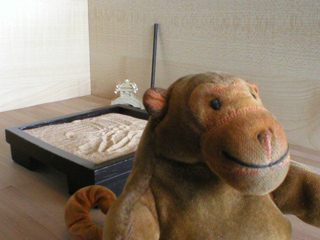 Mr Monkey found a quiet part of the house to contemplate in, and opened the box to see exactly what his Zen Garden included. 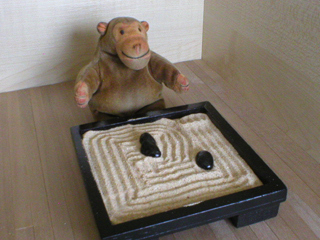 He found that he had a large sachet of sand, a wooden tray to keep the sand in, some stones and a small bridge to sit in the sand, and a rake to make patterns in the sand with. 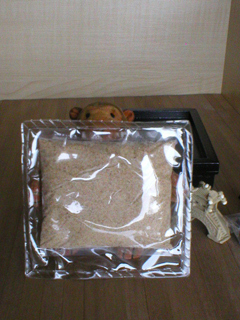 Mr Monkey realised he'd need a little help from Mr Rik to get the sand out of the sturdy plastic sachet. Mr Rik snipped open the sachet of sand, poured it into the tray, and gently shook the tray to settle the sand. 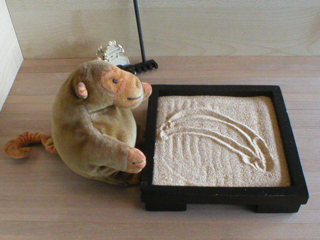 When the sand was level Mr Monkey picked up his rake and wondered what patterns to rake into the sand. 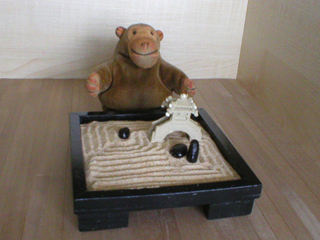 After placing the polished stones into the sand, Mr Monkey carefully raked the sand around them. When he'd finished he realised he'd forgotten the bridge thing, and added it. 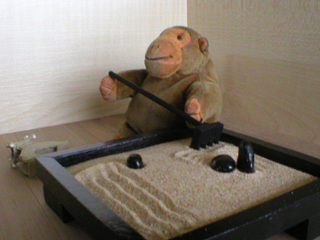 Mr Monkey put his rake down, and sat down to contemplate his Zen garden. After a few minutes he decided that the bridge was upseting his contemplation, so he removed it, moved the stones, and raked the sand again. Mr Monkey went back to contemplating his sandy garden and considering a Zen Koan or two, but the koans failed to alter his perception of reality and the contemplation made him a little hungry. It occured to Mr Monkey that he might contemplate a little better if he was contemplating something that wasn't just a set of straight lines, so he flattened out the sand again, and drew the first thing that came into his monkey head. Then he sat down to contemplate the image of a banana. Rather soon after Mr Monkey started contemplating the banana he began thinking about bananas in general. And when he started thinking about bananas in general he began thinking about particular bananas, specifically the ones in his banana store in the kitchen. So Mr Monkey gave up the contemplative life and scampered off to feast on bananas.